The Rev. Christopher Eid was named Dean of St. George Antiochian Orthodox Cathedral in Charleston, WV in 2014. He will assume the role in late July of 2015, when The Very Rev. Olof Scott retires. Archpriest Olof has faithfully served at the St. George Cathedral for 39 years. The Cathedral is the episcopal home of His Grace Bishop Thomas. After completing his professional training, he established a career in executive protection security and investigation. However, his love for the Church compelled him leave his job; with the blessing of His Eminence Metropolitan Philip of blessed memory , he enrolled in St. Vladimir's Seminary and completed his M.Div. degree in May of 2010. Immediately following ordination, Fr. Christopher was given a temporary assignment to serve alongside Fr. 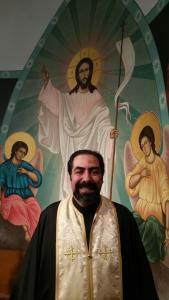 Elias Bitar at St. George Orthodox Church in Little Falls, NJ, before moving to Houston, TX to serve at St. George Orthodox Church from December 2011 to December 2014.